Learn about Golden State Greyhound Adoption Group. Learn how to adopt your own family Greyhound. Greyhounds available now for immediate adoption. Where to meet a Greyhound in person. Dates and locations. Help our greyhound adoption efforts by donating today! Read inspiring stories about GSGA adopted greyhounds. Adoption photos & fun pictures of our Greyhound friends. From "The Odyssey" to speedy runner to loving friend. More links and resources for your retired racing greyhound. Meet our dedicated greyhound adoption & rescue volunteer staff. Have questions? Let us help! Ask them here. Is a Greyhound Dog Right for Your Family? Many people wonder if they would be good greyhound guardians. A great way to learn about retired greyhounds is to visit one of our local Greyhound Meet & Greets in your area. Watch this video to learn some of the main characteristics of a greyhound and see if your environment makes a good forever home. You will learn that greyhounds are really couch potatoes! They make wonderful companions whether you live in a single family home, apartment or condo. Fill out this application if you are ready for a greyt experience adopting an ex-racer greyhound. Golden State Greyhound Adoption is an all-volunteer nonprofit organization that places retired racing greyhounds in adoptive homes in Northern California, including the San Francisco Bay Area, greater Sacramento area and beyond. Our ex-racing greyhounds come primarily from Florida racetracks. They are trucked from Florida to Colorado where Dr. Heather Weir DVM vets them and takes care of them until she transports them to California. When racing greyhounds are deemed no longer profitableeither because they aren’t winners or have sustained an injurykennels often try to adopt out these dogs, but sadly, many are destroyed, often before they reach the age of four or five. That’s where rescue organizations like Golden State Greyhound Adoption come into save these wonderful hounds. Greyhounds are sweet, gentle animals that adapt well to home life and make great companions and loving pets. Established in 2002, we are a West Coast-based rescue group and are one of the largest in Northern California. We invite you to attend our meet-and-greets, where you can meet some greyhounds "in person," talk with our volunteers, learn more about how we do our adoptions and take home information. We’ll help you decide if a retired racer is the perfect companion for you. Adopting a dog through Golden State Greyhound Adoption is a relatively easy process. You will fill out an application, and then one of our volunteers will visit your home to ensure the dog’s new environment will be safe and secure, and to answer any questions you might have. Then we’ll do our best to choose a greyhound that matches your lifestyle. When you adopt a rescued racing greyhound from Golden State Greyhound Adoption, you become part of a supportive community with other adopters. You will have an opportunity to meet each other through online forums and at greyhound playdates and our annual picnic. 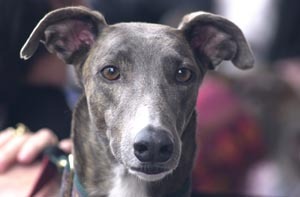 We will provide you with information and tips on caring for your retired racer. Our strong, ongoing support system for all our adopters ensures that your adoption will be successful and the greyhounds we place will find their forever homes. Want to Adopt a greyhound Contact Stu for details! Let their last race be into your life! copyright © 2014 Golden State Greyhound Adoption. Have site comments, or is something on the site not working? Please send email to gsga@astound.net.